San Francisco police Officer Eric Chiang told Bay City News that the victim was a man, but did not yet have additional information on the shooting. a text from an Appeal reader that said that the victim was in a wheelchair, but SFPD’s media relations representative could not confirm that, nor tell us his condition or the circumstances of the shooting. Though an SFPD spokesperson did indeed confirm with us that SFPD shot someone in SoMa, Dan McMenamin of Bay City News was able to get more details, and to discover that whatever did the shooting, it apparently was not a gun, with bullets. A woman who did not want to be named who works at San Francisco’s Community Behavioral Health Services at the corner of 10th and Howard streets told McMenamin she was told by other employees at the office that a man in a wheelchair had been shot with a rubber bullet. Tom Cebollero, owner of Metric Motors at 10th and Howard Streets, said he witnessed the chaos that followed. “I saw an ambulance come and go. I heard that a lady was taken off to the hospital,” he said. 12:23 PM: BCN’s McMenamin continues his reporting on the police shooting in SoMa, saying that the SFPD officer who shot a civilian was, himself, stabbed by the man he shot. The shooting happened at about 10:15 a.m. after officers responded to a report of a man vandalizing city vehicles in front of the San Francisco Community Behavioral Health Services building near 10th and Howard streets, San Francisco police Officer Eric Chiang said. Chiang said the man stabbed one of the officers, who then shot the man with a less-than-lethal weapon an unknown number of times. Both the officer and the suspect have been taken to a hospital, Chiang said. He did not have information on the severity of their injuries. An employee at the Community Behavioral Health Services building who did not want to be named said she was told by other employees at the office that the man shot was in a wheelchair. 1:50 PM: The Chron has some more details, saying that the mystery weapon was a “bean bag gun,” and that the victim, who they say “had been in a wheelchair, but was standing at the time he was shot” had been “stabbing tires of a city vehicle,” Officer Eric Chiang told the paper. They report that after one cop was stabbed in the right side of his body, “officers opened fire” and that both victims went to SF General with non-life-threatening injuries. 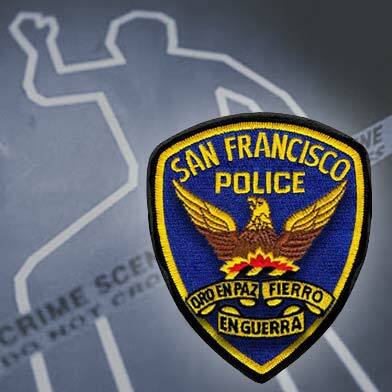 3:50 PM (Bay City News): A man was shot after he allegedly stabbed a San Francisco police officer in the city’s South of Market District this morning, a police spokesman said. The shooting happened at about 10:15 a.m. after officers responded to a report of a man vandalizing city vehicles in front of the San Francisco Behavioral Health Services building near 10th and Howard streets, San Francisco police Officer Eric Chiang said. The man, whose name has not yet been released, was in a wheelchair but was not confined to it, Chiang said. “He was seen up and moving about a number of times,” he said. The suspect had a rock and knife in his hand and was slashing the tires of some city vehicles in the area, Chiang said. He did not know what the man’s motive was for vandalizing the cars. Following some sort of altercation, the man stabbed one of the officers and then was shot with a less-than-lethal beanbag weapon, Chiang said. When the suspect did not surrender, he was also shot with a handgun, he said. Chiang did not know if the officer who was stabbed was the one who shot the suspect. The officer and the suspect were taken separately to San Francisco General Hospital to be treated for injuries that are not believed to be life-threatening, Chiang said.